Guns and Ammos is monthly magazine specifically created for recreational shooters, providing a deep emphasis and concern for firearm safety and proper usage of all sorts of firearms. Buy a single copy or subscription to Guns and Ammo magazine. The United States has a long and rich, albeit controversial in modern times, history with firearms and the proper usage. Whether for collecting, hunting, or sport shooting, firearms have always held a special place in the hearts and lives of many Americans. 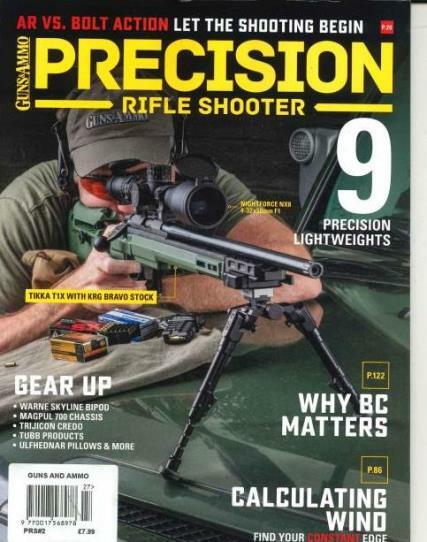 For years the magazine has been the most widely read magazine for firearm enthusiasts and users, and for many readers this publication is considered to be far superior then any other firearm magazine. Passionately dedicated for the love of the entire community and lifestyle revolving around firearms, it provides a huge assortment of articles, editorials, and photos that cover all firearm interests for shooters, collectors, and enthusiasts alike. Each issue contains truly expert advice on what it means to be a firearm owner in today’s world, including things like tips for safe shooting, techniques for improving shooting abilities, reports and reviews of old and new firearms, and everything else for either the beginner shooter to the locked and loaded firearm owners who proudly own a near obsession for this rich pastime. *Please note subscriptions of Guns and Ammo can include specials. Great magazine and lots of interesting articles. Covers a wide range of shooting and equipment.